Forecast: The Saturday opener is a wide-open grass grab bag for older maiden claimers over a mile on grass. We’ll use four, but you should spread as deeply as you can afford to. Aussie Fox is a logical top pick, though he was a beaten choice in his last start and may lack a winning punch, having finished second in each of his last three starts. But his numbers are solid, Van Dyke knows him well, and he should be in the fray and have every chance from the quarter pole home. Outlaw stretches out for the first time and has been pace-pressing in his recent sprints, so we suspect he’ll be on or near the lead from the start. Once well-regarded, the son of Violence is a light in the speed figure department but this will be his first start in a claimer so he could easily step forward. Arch Anthem is another showing up in a maiden claimer for the first time and also is adding blinkers while switching to Bejarano. Freshened since early December and training steadily for Mandella, the lightly-raced gelding will be doing his best work late. As a son of Point of Entry, Honor Guard certainly is bred to move up a ton on turf and gets his first chance after finishing a distant fourth in an off-the-grass sprint at Del Mar in late November. The D’Amato-trained colt has several other positive factors in his chart, including the always-dangerous blinkers off angle, the class drop from maiden to maiden claiming, a comfortable inside draw, a sharp five-furlong workout (3rd fastest of 101) a couple of weeks ago. He appears to have enough early speed to make or stalk the pace if that strategy is employed, and with just three career starts might have some upside that most of the others don’t. Forecast: This modest claiming sprint for 3-year-olds is another requiring a spread in rolling exotic play. In a race loaded with untrustworthy speed, Just Hit Play at least has shown the ability to be successful from off the pace, so we’ll give him a slight nod on top. A winner over this track and distance during the fall season, the Miyadi-trained gelding exits an infinitely tougher affair and should greatly appreciate the class relief. Owning once was highly-regarded (he brought $260,000 at the OBS April sale) but clearly is being culled from stable after gamely winning for $32,000 at Los Alamitos in December and dropping to $25,000 today. He’s a first-time gelding, so maybe he’ll improve his recent modest numbers. Runningwithscissors earned a strong speed figure breaking his maiden at Los Alamitos two runs back, but races from there don’t always translate to Santa Anita, so we’re not sure he can be trusted. We’ll toss him in on a ticket or two, as we will with Two Fifty Coup, a runaway maiden claiming winner two races back last fall and sporting the blinkers off angle but beaten at relatively short odds in four of his six career starts. Forecast: ​ Our Silver Oak appears to have much in his favor in the California Cup Turf Sprint, a downhill dash restricted to 3-year-olds. The first-time gelding was a distant but respectable second to the extremely talented Galilean in the King Glorious Stakes two-turning on dirt at Los Alamitos in December, and today catches a much softer group while returning to what we believe is his best preferred surface, grass. The Morey-trained son of Unusual Heat likes to settle and produce a run, a style that should provide him ample opportunity to exert his superiority in the final furlong. Rail and all, he’s a straight play and rolling exotic single. Forecast: Edwards Going Left won the California Cup Sprint last year with a career top speed figure and appears primed for a similar effort today. Freshened since November and working like he’s retained all of his speed, the Sadler-trained gelding has won half of his 10 starts over the Santa Anita main track and should be able to settle behind the front-running Richard’s Boy and then take aim from the top of the lane to the wire. The rail is no bargain, but he should be good enough to overcome it. Richard’s Boy has been primarily a turf specialist throughout his career but can handle the dirt as well and in fact has won twice over the Santa Anita main track. He’s the quickest of the quick, and if can get away with a relatively soft opening quarter the Miller-trained gelding may roll all the way to the wire. We’ll prefer Edwards Going Left on top but use both in our rolling exotics. Forecast: Spend Spend Spend had the good fortune of drawing the outside post in this entry-level allowance sprint for fillies and mares and seems capable of taking full advantage of the situation. After getting caught up in a speed duel in a similar spot last month, the lightly-raced Majestic Warrior filly has the luxury of settling just off the pace and then moving when she wants to, a strategy that surely will be employed by Talamo. Her impressive maiden win at Del Mar in early Decembers should be more than good enough, if repeated. Easy Grade is intriguing and should be included at least on a ticket or two. She’s a perfect one-for-one over the Santa Anita main track and is being reunited with “win rider” Bejarano, who’ll likely let her settle and cut her loose late. Her comeback race on turf at Del Mar was much troubled; with clear sailing today, she should be able to show her best stuff. Forecast: ​Here’s another very difficult grass race with an unsettled pace scenario that could produce a chaotic result. Gliding By can be dangerous if she is allowed to use her rail post to good advantage. Overmatched when facing graded stakes company in her last start, the Baltas-trained mare returns to her proper level and has enough early speed to draft into a highly-favorable pace pressing or stalking position while saving ground, and then have every chance when the pressure is turned on from the top of the stretch to the wire. She won over this course and distance during the fall season with a speed figure good enough to beat this field, so let’s put the veteran daughter of Artie Schiller on top. Tooreen Dancer has been off the track since last April but her recent workouts are encouraging for a mare who can fire fresh (she won her debut and you can get any fresher than that). She’s a tad light in the speed figure department but with only four career starts (with two wins) the D’Amato-trained Irish-bred probably has room for improvement. Siberian Iris might be worth tossing in as a saver; she’s always preferred to run second or third rather than win, but both of her career victories have come over this turf course and she is a fit on speed figures. Van Dyke, who was aboard in her win two runs back, returns for Mandella. Forecast: Exultation drops for the money run and seems the solid choice in this nw-2 $25,000 abbreviated sprint for 3-year-olds. A winner on dirt at Los Alamitos three runs back, the Eurton-trained colt ran okay in a pair of recent downhill turf dashes when facing tougher foes, but this is the proper level for the son of Paynter to regain his winning form. Surfside Sunset lands the cozy outside post and should draft into an ideal pace-stalking position. He was a voided claim last August and was stopped on but returns in a realistic spot and has won over this main track in the past. He seems like the most dangerous of the closers. Preference on top goes to Exultation but we’ll have a ticket or two as a backup with Surfside Sunset. Forecast: Christy Jackson has a career record of 2 wins from 22 starts with 12 seconds and thirds, so while she’s usually in the fray she clearly lacks a winning punch. However, the veteran Hess-trained mare really should win this restricted (nw-3) $25,000 claiming extended sprint for fillies and mares. She was more than six lengths clear of the rest when runner-up in a similar event here earlier this month and today lands the favorable outside post that will allow Bejarano to employ a stalk-and-pounce strategy. Don’teatmycookies is being wheeled back in six days after a game but hard-fought win vs. softer foes. Obviously, the short rest is a concern and today she has to deal with an extra half furlong, but she’ll be the controlling speed and could keep going again in a field with suspect closers. We’ll use both in our rolling exotics but otherwise not getting too involved. Forecast: ​ S Y Sky won her only previous start over this course and distance way back in July of 2017, but a strong case can be made that she was a better type then than she is now. The 5-year-old mare has failed to deliver the goods in each of her last four starts as a short-priced favorite (though she was handed a win two runs back via disqualification), so while the daughter of Grazen seems like the logical pick on back class, she’s clearly no longer one to trust. We’ll use her, but also include her late-running D’Amato-trained stable mate Barbara Beatrice, who should produce a significant forward move in her second start off a layoff and with the return to turf. A stakes winner down the hill in her younger days, she’s now seven-year-old but still has some spark, as she displayed in a bullet training track drill just six days ago. Cordiality also is worthy of strong consideration; she’s been primarily a router but does show a Hillside score back in June of 2017 and will be making her first start off the claim for Miller, who wins at a terrific 29% with this angle. Forecast: Roaring Fork seems best on paper in this modest restricted (nw-2) $12,500 claiming router and we’re expecting he’ll take full advantage of the situation. The son of Mineshaft broke his maiden by 12 lengths here in a two-turn affair last summer while earning a career top Beyer figure, and this will be his first outing over the local main track since. Overmatched from a poor draw on grass last month, the McCarthy-trained gelding retains Gryder and projects to enjoy a comfortable second flight trip. Builder is worth using as well; the Belvoir-trained gelding finished second, beaten just a neck, vs. similar earlier this month while earning a career top speed figure and if he can turn in two alike he should be competitive right back. We’ll try to get by using just these two while recognizing that at this level none of these can truly be called trustworthy. 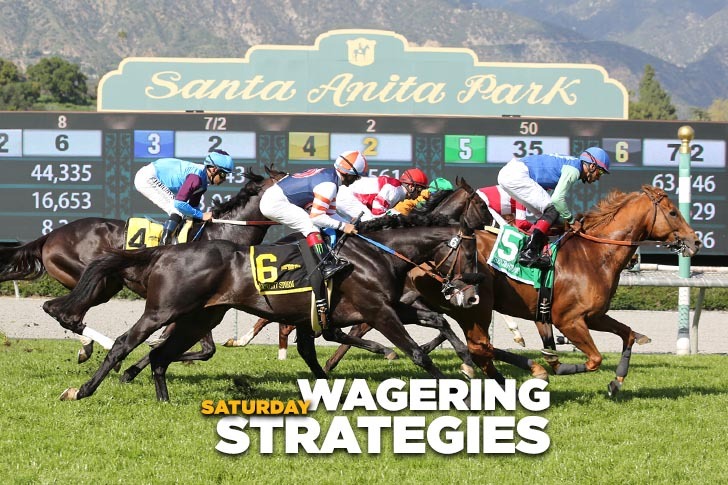 Forecast: Ashleyluvssugar returns to state-bred company, and while the 8-year-old gelding certainly has seen better days, he continues to impress in the morning and deserves top billing after facing tougher graded stakes foes in his last three starts. The old pro shortens to nine furlongs (never worse than second in four starts at this trip), retains Baze, and should settle nicely in either a pace-forcing or pace-stalking role. The Eurton-trained son of Game Plan captured this race two years ago, and it would be nice to see him win it again. He Will tries blinkers and a change of jockey after a non-effort in a strong overnight race last month. Good enough on his best day to win a race like this, the Hollendorfer-trained veteran still retains a dangerous late kick when aggressively ridden. Marckie’s Water shows three career victories over the Santa Anita course and is highly-competitive based strictly on speed figures. He’s a one-paced sort, but with a little bit of help up front and clear sailing through the lane he could make his presence felt at a decent price.